Thanks to a quirk of our cosmos, the moon's average distance from Earth is just right for it to appear as the same size in the sky as the significantly larger sun. Once in a while the moon slides directly between Earth and the sun such that it appears to cover our star completely, temporarily blocking out its light and creating a total solar eclipse for those along the narrow path cast by the moon's shadow. Next week, on 21 August, observers situated along a 115 km-wide swath stretching from Oregon to South Carolina in the US will be on this path of totality, with peak totality occurring at 18:26 GMT (check here for detailed timings). For up to 2 minutes 40 seconds, observers at a given location will be bathed in an eerie twilight in the middle of the day. It is not possible to view totality from Europe, although those in the westernmost region may see a partial eclipse before the sun drops below the horizon at sunset. 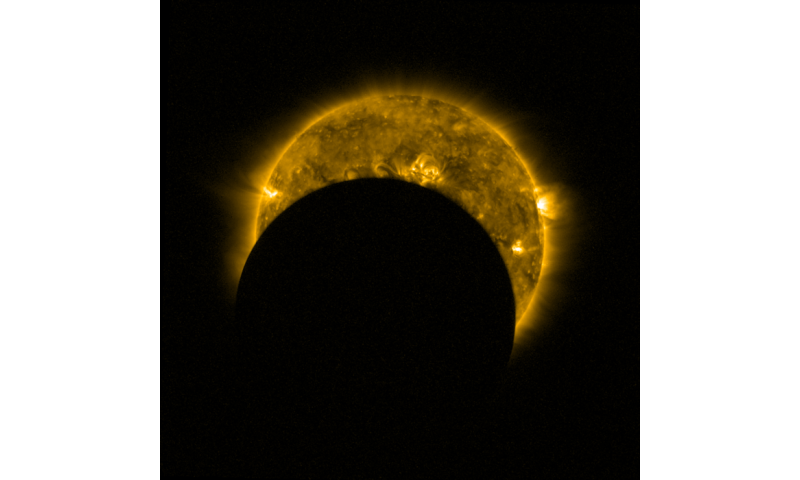 A team of astronomers from ESA will be studying the eclipse from the USA and, like many others, hoping that skies will be clear so that they can capture the phenomena visible only during eclipses. These include beads of light shining through gaps in the lunar terrain, and the glittering 'diamond ring' effect as the last and first slither of sunlight glints through immediately before and after totality. They will also aim to image the sun's extended atmosphere, the corona, which is visible to the naked eye only during totality when the rest of the sun's light is blocked out. Observations of the corona are business as usual for the ESA/NASA Solar and Heliospheric Observatory, SOHO, which can use a special filter to block the sun's light. During Earth's total eclipse, SOHO will provide important context of the corona and sun's activity from its viewpoint in space. Outside of the path of totality observers will experience a partial eclipse – seeing the moon appear to take a bite out of the sun's disc. This is similar to what our Proba-2 satellite will see – an example is shown in the image presented here, which was taken during the annular eclipse earlier this year. It shows the turbulent solar disc and swirling corona at extreme-ultraviolet wavelengths. In fact, Proba-2 will see a series of partial eclipses from Earth orbit. Proba-2 orbits Earth about 14.5 times per day, and thanks to the constant change in viewing angle, will dip in and out of the moon's shadow several times during the solar eclipse. In addition, astronauts aboard the International Space Station, including ESA's Paolo Nespoli, should also be able to see some aspects of the eclipse. From their unique vantage point, they will view partial eclipses and also hope to capture the moon's shadow on the surface of our planet. Follow ESA's ground-based activities via cesar.esa.int and join the conversation on Twitter with #eclipse2017 and #solareclipse. We'll keep you posted on our activities – from ground and space – via @esascience.